This budget priced liquid detergent available exclusively at Costco is formulated for both high efficiency (HE) and conventional washing machines. 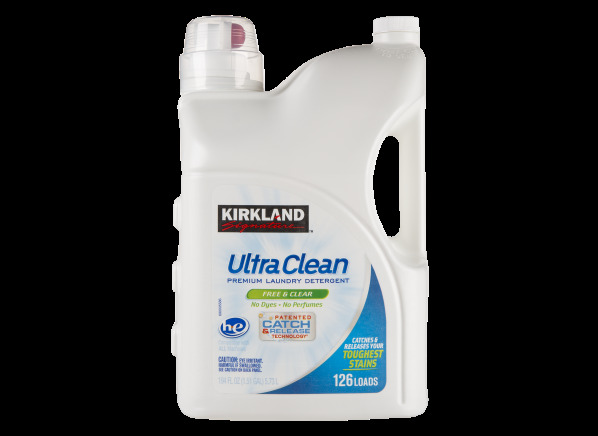 The Kirkland Signature (Costco) Ultra Clean Free & Clear is part of the Laundry detergent test program at Consumer Reports. In our lab tests, Laundry detergent models like the Ultra Clean Free & Clear are rated on multiple criteria, such as those listed below. Body oil: Indicates how well a detergent removes body oil or "Sebum". Dirt: Indicates how well a detergent removes dirt or "Clay". Grass: Indicates how well a detergent removes grass stains. For sensitive skin For sensitive skin Manufacturer claims this detergent contains no dyes or perfumes.